I’m not a big fan of salads. A plate full of raw vegetables just doesn’t do it for me. That said, I really like Caesar Salads. My wife S, of course, likes to complain that a Caesar, like a Cobb, is hardly healthy and I really shouldn’t be pretending that by ordering one I’m watching my ever-increasing weight. The Caesar, for fascinated food historians, was reportedly invented by Caesar Cardini, an Italian restaurateur in Tijuana, Mexico, and first served on 4 July, 1924 to a group of vacationing Hollywood stars. Also noteworthy is that the original Caesar didn’t have any anchovies in it. The original contained just Romaine (Cos) lettuce, coddled eggs, garlic, Worcestershire sauce, lemon juice, olive oil, freshly grated Parmesan cheese, croutons, salt and pepper. When the achovies were added is kind of a culinary mystery. These days, the classic Caesar uses an achovy-accented dressing and often includes bacon. Many restaurants also top their Caesars with pan-seared salmon, chicken or prawns. My favorite Caesars in town are the ones made by Project Shop Café and the garlic prawn version that chefs Jimmy Chok and Anderson Ho used to make at Fig Leaf restaurant, way back when it was in Central Mall. The great thing about a Caesar Salad is that once you’ve made your dressing, it’s actually a cinch to make. We like to use Thomas Keller’s dressing recipe, found in his French Laundry Cookbook (and transcribed below). Keller’s Caesar, of course, is tres chic. But this dressing works just as well on simpler versions. For our weeknight quick fix, S and I used baby Romaine, maple-smoked bacon, poached eggs, freshly grated parmesan, and prawns dusted in salt and flour and then quickly fried. Easy, healthy (well, healthier than a slab of pork belly at least), and quick. Purée the garlic, shallots, vinegar, mustard, lemon juice and achovies in a blender until smooth. Transfer to a mixer with the paddle attachment and beat in the egg yolk. With the machine running, slowly drizzle in the oils. Season with white pepper. Cover and refrigerate. This can be stored for up to 3 days. this looks tasty – i happen to love salads quite bit and eat them almost every day. and anchovies are great – if you get the good ones packed in salt. That dressing looks marvelous. Good thing I eat anchovies just in Caesar salad and in pasta puttanesca! 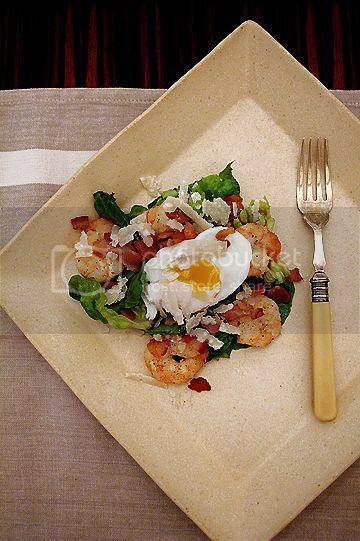 I never thought of placing a poached egg on top of a Caesar salad. Very bourgie and very delicious. Gee I’m a huge salad fan! Caesar is one of my fav. Esp when I feel like havin a not too fanciful salad. To me, Caesar salad is simply down-to-earth salad. But I can skip de anchovies part thou if I haf a choice. Otherwise, am jux as fine with it too. Usually I either haf my Caesar plain or topped it up with Grilled Chicken Breast. (Chicken breast MUZ be nicely seasoned & not over-grilled of cux.) Thks for de informative backgrd on how Caesar came abt. Dat’s what I love most abt yr post besides de “Super duper tempting” fd pics. Backtrack: Hey CH, forgot to tell U. I finally found Victor’s Dim Sum at Sunshine Plaza. Food is really YUMS & price is really reasonable. Guess wat, aft the 1st introduction of Victor’s to my fren, she got totally hooked on the place. We have since visited the plc on a Really frequent basis. Avg is twice a week. Loved de Steamed Carrot Cake (my fav), Siew Mai, Glutinous Rice & Double Milk Dessert (alias Steamed egg white with Milk) with choice of Almond or Ginger. Oh! He jux added a new item to his menu a few days ago. Chee Cheong Fun with Shrimps. Superb too! He hasn’t had time to officially put it into his menu hence, U jux haf to ask for it when U order. I agree with nosh, the egg on top is fab! A weakness… I think i might eat anything if it has a poached egg crown! hey chubbyhubby, i agree with S. caesar is no skinny salad. its a psuedo. btw, I added your blog as a link to mine, hope you dun mind. your blog is one of my favorite!So nice and refreshing! As always, your picture look so good! Thank u for sharing that with us. I’m a new food blogger, so i will be very happy if you gave me a little visit! Oh yum. That egg looks perfect on the top. It’s been a long time since I’ve had a great caesar salad, I’ll give this a try! Oh, this look really good. I am not a huge ceasar sala person, but this looks like it has a litlle extra something to it…thanks for sharing it! Nice salad.. those parmesan bits look like rock candy or something… haha..
MM: Actually, the sauce that Keller makes is quite subtle. You don’t taste the anchovies too much. Gastrochick: Yah, his recipes require an army of sous-chefs, or at least a few of Michelle’s ewoks. Bouchon is a much easier book to use. But FL is useful when you use components of his more elaborate dishes. Radish: Thanks. I’m actually not an achovy fan. But I think a Caesar isn’t a Caesar without an anchovy dressing. It’s the only time I like them. Nosheteria: I love poached eggs on most things! It’s wonderful on salads. Cin: Thanks. Hey, super thay you are now a Victor’s regular. Anonymous: Hmmmmm… good idea. I’ll work on that. Shaz: Heh. Thanks for the link. Ooishigal: Welcome to world of food blogging. There are some great people in it. Thanks fo visiting. Michele: Cool. Thanks for dropping by. Fred: The lastest post is for you pal. Where would you recommend to go for some great salad? I’ve tried some which were plain, and the quality’s not there.. Won’t mind paying for good stuff if i can find it! Thinking of getting it for a friend who’s having a bad tummy upset, so i think salad’s a good choice. What about nice scones and chicken pies? Any recommendations? holy crap, i’m making this tonight. I made this dressing and it’s delicious! My French husband liked it too. I would describe this as being somewhere between a Caesar’s salad dressing and a balsamic vinegarette. Definitely a keeper. What is in the salad?